﻿ “End of the Beginning:” What Was Achieved at COP-21? “End of the Beginning:” What Was Achieved at COP-21? Other major steps announced in the months leading up to Paris lent momentum to this critical inflection point. The increased willingness of the private sector to tackle climate issues owes in part to a fundamental shift in the costs of clean energy technology, said Mountford and Andrew Steer, president of the World Resources Institute. As a recent Wilson Center event highlighted, the price of renewable energy has plummeted in just the last few years and is now cost competitive with fossil fuels in many parts of the world. Sources: Breakthrough Energy Coalition, Carbon Pricing Leadership Initiative, CDP Worldwide, The Huffington Post, The New York Times, The White House. 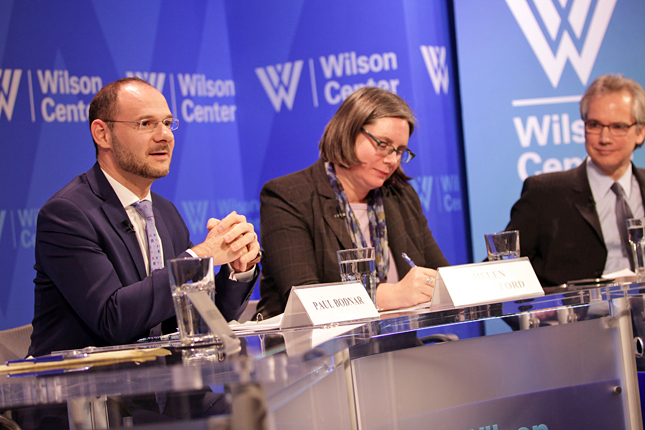 Photo Credit: From left to right, Paul Bodnar, Helen Mountford, and Andrew Light, by Schuyler Null/Wilson Center. Roger-Mark De Souza on the Paris Climate Agreement, With or Without the U.S.